The African stocks of the University library are listed in the general Catalogue of the library. The OPAC contains books and media and in addition all journals, e-journals, e-books, and databases. You will find all journals dealing with this theme in OPAC. In addition, the journals available in Frankfurt, as well as those from other German libraries, are listed in the national Zeitschriftendatenbank (ZDB - database for serial titles). Articles from these periodicals are available through the interlibrary loan system. You will also find electronic journals related to Africa in the electronic journals database (EJB). Please note that some of the journals are only available to registered users of the Frankfurt University Library. When researching the OPAC select the search field "Classification [KLS]" and enter the notation in the search line, for example "kol Bl?" for the literature of German East Africa. In addition, the catalogue of the Colonial Library is available online as a PDF file: Volume 1 contains the alphabetical division and Volume 2 the division according to the arrangement of the catalogue of the German Colonial Society library. The German Colonial Library consists of the libraries of several colonial societies. 88% of the literature stems from the first half of the 20th century and 12 % from the19th century. The content of the Colonial Library is divided into two sections: literature dealing with colonial matters in general (including business, mining, and missions) and literature dealing with individual regions. Of this 60% is concerned with Africa. It comprises the official papers of the colonial powers as well as the official publications of the colonies themselves. The other section contains a literature collection from all subject areas related to each of the colonised countries: from geography and economics to ethnology, and includes vocabulary collections and fiction in the indigenous languages, as well as trivial literature (colonial novels). These volumes are digitzed and placed on the net as searchable PDF files. Pay special attention to the subject indexes at the ends of the volumes from which you can find the corresponding Eppelsheimer notations. Die Funktion moderner afrikanischer Literaturen : Afrikan. Literatursymposium ; Ausw.-Bibliogr. 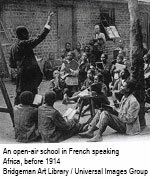 zu afrikan. Autoren ; [Literatursymposium: 04. - 06. Oktober 1980 im Römer ; Ausstellung, 03. - 15. Oktober 1980 in d. Stadt- u. Universitätsbibliothek ; Begleith. zum Literatursymposium u. zur Ausstellung] / Rüggeberg, Ellen . - Frankfurt am Main : Stadt- u. Universitätsbibliothek, 1980. The classification in the Eppelsheimer subject catalogue has also been given in OPAC. The notations of the classification are directly searchable in OPAC by means of the search key KLS. Select in the upper right-hand corner "Classification [KLS]" and enter, for example, "334 Da 23?" The letters sub-divide a subject group into large sections like disciplines. The century groups sub-divide the letter groups more narrowly. The last two digits may offer an additional sub-grouping via a key. The question mark truncates the search so that all possible key numbers (the last two digits) are simultaneously found. You can also check in the index which systematisation places have been assigned. Change the pull-down menus in the upper left-hand corner from "search (and)" to "browse". Enter the start of the notation in the search line e.g. 334 Da. You will be given an alphabetically sorted list that contains all assigned notations. New acquisitions are indexed by means of the Eppelsheimer Classification (see above) and, since 2000, with the "Subject Headings Authority File" (SWD) subject headings according to the "Rules for the Subject Catalogue" (RSWK). The RSWK search has the disadvantage that, for example, a book about a particular town will only be found under the (narrowest) subject heading of the town but not under the subject heading for the region or the country. Homophonic place names or geographic descriptions can be distinguished by means of an addendum in pointed parentheses e.g. "Congo " and "Congo ". If you are not certain of the exact form of the geographic index word, for example whether an addendum is necessary or not, or what the addendum should be, truncate the basic entry with "?". For example a "Subject heading [SWW]" search for "Congo? " retrieves the literature for both countries. You can restrict searches to acquisitions of the special collection area by means of subject codes, for example the general search "FAC: 631 AND SWW: Menschenrecht" comprehensive literature dealing with human rights in Africa or individual African countries. For all enquiries concerning literature searches and catalogues please contact the person shown alongside. To view the current new acquisitions of the special subject collection "Africa south of the Sahara" see the monthly lists divided by subject. In addition, you can assemble new acquisitions lists for longer periods yourself (self assembly, information in German only). If you are unable to find particular titles here we will be happy to have your suggestions for further acquisitions. We will do our best to fulfil your wishes insofar as our collection profile and our financial possibilites allow.